Takin' One For The Team! Every once in a while a person has to 'take one for the team' right? Yesterday, our best friends Mary & Joseph adopted three sheep. Three very sweet sheep in need of some special care. Their previous owner could not find anyone willing to come shear her sheep. It can be very difficult to find one willing to come out for 'just' three sheep. Unless they live near the sheep or the shearer's path takes them near your farm, it can be pretty impossible. SO, moral of THAT story? Always have a shearer lined up, or plan to shear them yourself if you acquire sheep ok? There are fewer and fewer young people going into the shearing field- start looking or learning ahead of time!! Mary & Joseph hitched up their trailer and picked up the sheep, along with several llamas and an alpaca. While they loaded everyone up, the sheep pictured above got away and off he went, happily galloping down the driveway and out of sight. What a nightmare! Mary spent hours walking, listening and looking for that sheep with no luck. Joseph assured her the sheep would come back home as soon as it started raining. Next day, rained and rained-the sheep magically showed up back in his nice dry barn just as predicted! We always swear Joseph is the critter whisperer. He can make friends with and understand any animal. They know right away Joseph will be kind and that he likes them. It's a gift he has and we are always glad for Joseph's wisdom! The above sheep came home that day in the carrier on the back of Mary's truck. There! All three sheep safely at their new forever home. Phew! We are not sure exactly what type of sheep these are, besides cute and adorable- and a mess. The previous owner said they had not been sheared for a year but it may have been more like two. The outer part of their fleeces were covered, jam packed with cockle burrs. 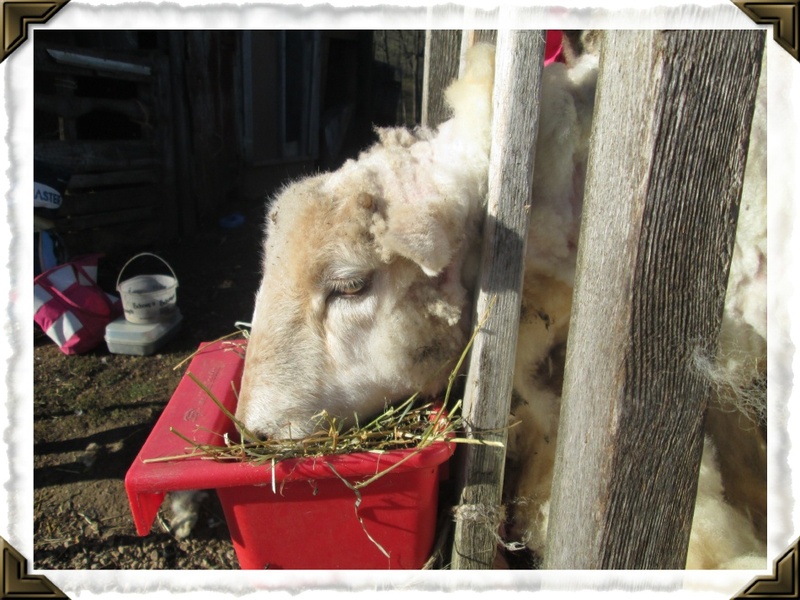 Mary decided to shear them even though it is getting chillier in Wisconsin. All that wool would make them an easy catch for coyotes. If that much wool gets wet the sheep could tip over and not be able to get up. They could also end up stepping into a snow drift, sinking, then needing a hauling out of the hole. None of them good options at all! SO, onto the shearing stand, a little hay and grain to keep a sheep happy and off we went. Mary used her super powered clippers and I used sharp scissors to trim around their faces and necks. I also split paths through the burrs so Mary could get to the sheep's body with the clippers. We started around 2 p.m. Saturday afternoon. It was nice, breezy and almost 60 degrees. Perfect! 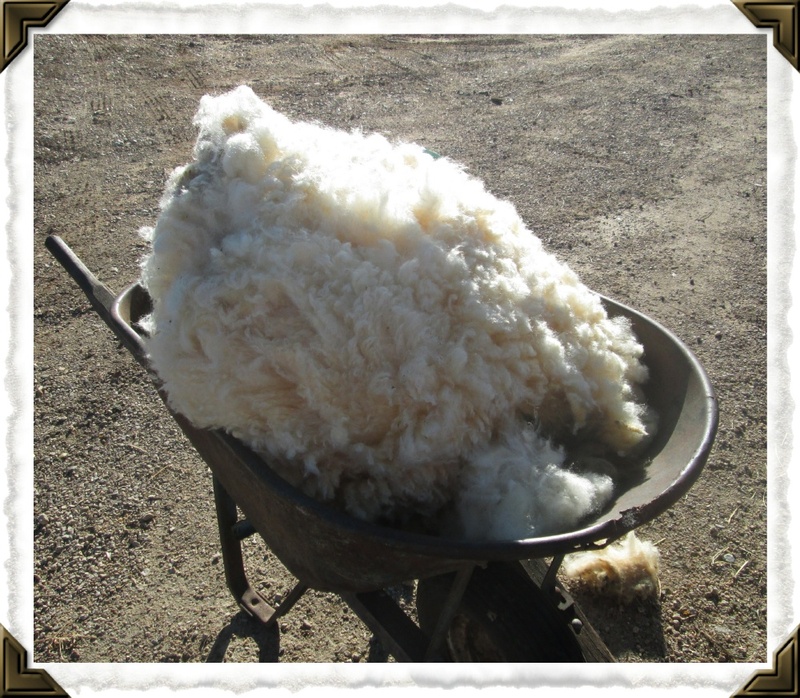 We took a lot of pictures so we could show just how much wool was on the sheep. I think they MUST have felt better as soon as some air hit their skin. They didn't fuss or jump around after they felt a little better the longer we worked on them. I really do think they know when someone is trying to help them. They each were so tired from the travel and being upset that about mid-shearing they rested their noses on the feeder and almost closed their eyes. It was so sweet. The sheep were very very good for us. And Mary does a wonderful job shearing! 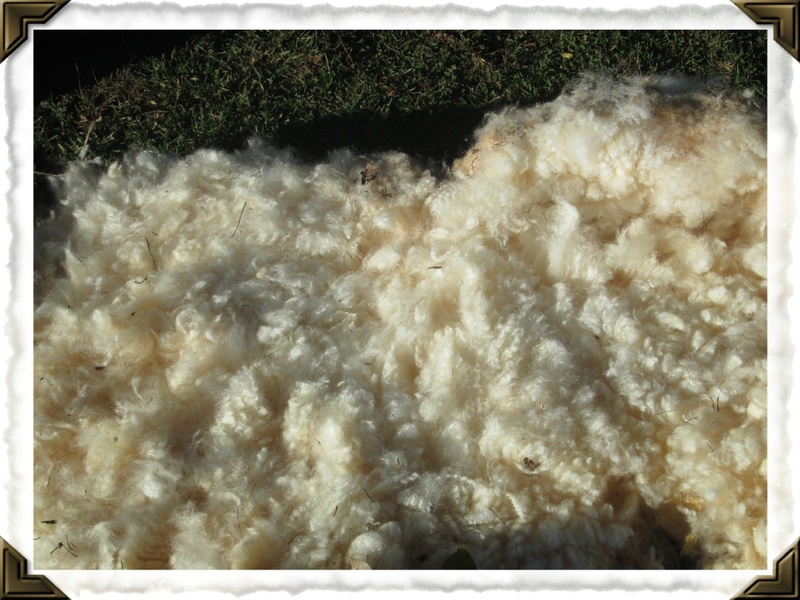 This is the fleece from the first sheep we sheared. It is sitting in a large, older wheel barrow. Whoa right? And with the burrs hidden/rolled up inside the fleece, sure looks pretty! The fleeces almost peeled off in one big sheet. Then for even more perspective, I laid the fleece out next to hubby Jim's car- a pretty, blue Ford Focus- that could use a bath. (Have to talk with our sheep about that. They are falling down on their job again!) The second and third fleeces were actually bigger than this one. As I mentioned earlier, we are not positive what kind of sheep they are. I am guessing by looking at the fleeces. I think one is Lincoln or Border Leicester; one is Tunis and one is Columbia. Or crosses including that type of sheep? The fleeces are beautiful. I brought them home with me and next rainy day I am going to get one out and start saving them from the burrs. THAT will be a job! A nice one for a gloomy day though! If I am lucky I will be able to lay the fleece out burr side down, then use my clippers to shear the fleece again. (Have to admit, I usually end up using at least 2 pairs of scissors.) The locks on the silkier fleece are a little more tangled than the others. I think the locks will be 4 inches long when retrieved from the burrs? The other two fleeces are around 11+ inches long including the burrs. I should end up with 9-10 inch long locks once retrieved.We have not weighed the fleeces yet but my best guess is each weighs between 20 and 40 pounds? I'll try to find a good way to weigh them up asap. This is the 'after' picture of one sheep. We did not finish shearing them until some time after 6 p.m. last night. I can't imagine how it must have felt to be so 'free' again? How weird it was to feel air on your skin again? To be able to run and play? We felt good giving that back to them. Otherwise, they are very healthy sheep and just so sweet. They were not been handled much in the past but were very friendly after all was done and cleaned up. They spent the rest of the daylight exploring their new pasture home. They romped and ran like big goofy lambs! Bunny hopping, racing and just being silly. What a relief for them- and us. I am so happy they have a forever home at Mary & Joseph's. They will be reunited with their llamas and have new llama and goat friends. AND love, good care, freedom and only expected to be happy. Oh, and give nice fleeces for their fiber fans right? Squeee for sheep and all of us too!! And don't worry. If they get chilly with out their crazy wool, I'll give Mary sheep coats that will help them keep warm. They have a nice warm barn for shelter, plenty of bedding and good food. The weather is supposed to stay around 60 tomorrow and 50-ish the rest of the week. The sheep look so nekkid after shearing- and all that pink skin? Yipes! However, as the lanolin dries a little, the wool floofs back up quickly. There is usually 1/2 inch of wool remaining on the sheep. And with the cooler weather they will be growing that wool back in a hurry. You would be amazed how fast that wool grows! When I was all packed up (two fleeces in the trunk, one in the back seat) I went out to see what Mary's new sheep were up to. The picture above is so sweet to me. Their ears were up, they were exploring their new home and making sure to stay together like good sheep families should. Mary, Joseph and I are exhausted and sore- but it was worth every second to give back a sheep's sense of well-being, safety- and love. Thank you Mary and Joseph for being so kind. We've been friends such a long time and really been in some crazy situations together involving animal welfare. This time will always be one of my favorites. I adore you both for everything you are. And all you help me be. Smooches everyone- hope you'll take a minute to stop by our sheep's website to see what is new! Sign up for our newsletter so you don't miss out- the sheep have newitems AND a sponsorship program we'll be launching later this week. Smooches to you all from all the sheep at Mary's and our sheep here at the Homestead! Sandy & Jim Ryan www.homesteadwoolandgiftfarm.com ...where sheep may safely graze.